Can the best fan of the worst franchise in sports finally find happiness? Say this for Darrell Bailey: He isn't about to die for the Los Angeles Clippers. This is not for a lack of trying. On a Saturday afternoon last year, the 43-year-old was driving though his Lynwood, California, neighborhood when he began to feel an ache in his chest. The ache became a throbbing pain. Scared, he called his mother. You might be having a heart attack. Get yourself to a doctor. Bailey did. He spent the night in a nearby hospital, resting and undergoing medical tests, and as the next afternoon dragged on, he realized something was seriously amiss. In a few hours, the Clippers would be playing the New York Knicks. At Staples Center in downtown Los Angeles. Uh-oh. This wouldn't do. Bailey hadn't missed a Clippers home game in nine years. 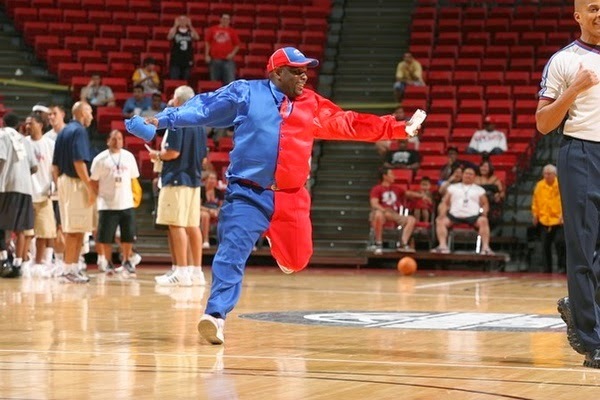 Clipper Darrell hadn’t missed a home game in nine years. Three hundred and eighty-six consecutive games of leading cheers and dancing in the aisles and heckling opposing free throw shooters; of lost games and Donald Sterling and Blake Griffin missing his entire rookie season with a broken kneecap; of popping lozenges and dressing like a "Batman" villain and being a superfan -- note: not an official diagnosis in the DSM-IV -- of the single worst franchise in the history of American professional sports. This was a streak, like Cal Ripken or Brett Favre or the guy who spent almost 64 consecutive hours sitting inside an ice block in Times Square, and Clipper Darrell was not about to let it slip quietly into a good night of bland food and backless gowns. High cholesterol and higher blood pressure be damned. "If I was your husband," he asked a nurse, "would you let me leave?" "No, Darrell," the nurse said. “We can't do that. Your tests haven't come back yet." Bailey stayed put. But only for one more night. He hasn't missed a Clippers contest since. Which figures. When it comes to pro basketball fandom -- irrational, inexplicable, downright lunatic devotion to brightly colored mesh jerseys -- there is Clipper Darrell, and then there is everyone else. Case in point? When the Clippers recently completed on-again, off-again high-stakes trade for star point guard Chris Paul, Bailey didn't celebrate by texting a buddy. Or high-fiving a coworker. He wept. Jesus at the tomb of Lazarus. Great big salty tears. Only don't get Bailey wrong: It wasn't the single greatest day of his life. He's married. In fact, it wasn't the second, third, fourth or even fifth-best day of his life, either. Bailey has four children. But Day No. 6? Definitely. Definitely better than the time Shaun Livingston's knee all but exploded. Or the time Sterling heckled Baron Davis during a game. Or the time the Clippers actually made the playoffs for the first time in 14 years, and Bailey was so excited that he tricked out his BMW into a custom, red white and blue Clippermobile, and even had everyone on the team sign the hood, only to watch the very same players finish the ensuing season with yet another losing record. "You can't imagine the suffering I've been though," Bailey says. “The mockery. The criticism. People saying, 'Man, why do you even cheer for this team?'" Good question. Is Bailey crazy? Short answer: Maybe. Long answer: Bailey has a Clippers-themed room at his house, and a matching mini-basketball court out back, both decorated in the colors of a franchise synonymous with abject futility. Chicago Cubs fans have more to be proud of. Thing is, it didn't have to be this way. Bailey's parents root for the Lakers. Most of his friends root for the Lakers. His children root for the Sacramento Kings, the Phoenix Suns, the Miami Heat ... and, yes, the Lakers. "This is a Lakers town," says Michael J. Sammis, a music industry executive and former Clippers season ticket holder. "Being a Clippers fan isn't like being the little brother -- it's like being the little adopted brother that your parents didn't want. You go to a Lakers-Clippers game, and even if the Clippers are the home team, it's 90 percent Lakers fans. Literally like an away game. All yellow. It's terrible." In Los Angeles, two roads diverge into the woods of fandom. One is a purple and gold autobahn, eight lanes to glory, freshly paved, with exits to 16 championships, Hall of Fame players and a smirking Jack Nicholson sitting courtside. The other is a dirt path, unmarked except for a tollbooth manned by Billy Crystal, and after a short, bumpy ride, it abruptly ends at the edge of steep cliff. Perched above a lake of molten lava. Bailey chose the latter. Chose it willingly. Some fifteen years ago -- no matter when Clipper Darrell tells the story, it's always fifteen years ago, an essential aspect of his creation myth, like the orphaning of Bruce Wayne -- Bailey was fired from his management job at a pager and cell phone company. His boss told him he would never amount to anything in life. Despondent, Bailey went home and turned on his television. The Clippers were playing. And losing. The announcers were ripping them, because they were the Clippers -- a franchise that would never amount to anything, either. Bailey could have changed the channel. Probably should have changed the channel. Instead, he made a vow, right then and there: Never amount to anything? This is my team! We're going to rise together. Go to a Clippers game, and this is what you’ll see: Bailey out of his seat, leading cheers, just like he does at church. (Gimmie a J! When I say Jesus, you say Christ!) He also heckles opposing free throw shooters: U-G-L-Y you ain’t got no alibi! You ugly! Once, while sitting courtside, Bailey directed the chant toward then-Boston Celtics guard Tony Allen. Allen missed two free throws. A few minutes later, he approached Bailey. Man, you got some nerve calling me ugly! "I don't think I make them miss," Bailey says. “I just think they do so much laughing or wonder what I’m about to say that they end up missing. A lot of players look forward to it. Rashard Lewis told me I'm an icon among the players. I was like man, for real?" Like any good icon, Bailey has a signature look: His half-red, half-blue Clippers suit, a shiny, three-piece mashup -- complete with matching tie -- that was born when Bailey bought two separate suits for $1,300, sliced them down the middle and asked a tailor to recombine them. "He thought I was crazy," Bailey says. "It started with the NBA dress code. If the players had to dress up, why not the fans?" Next came the Clippermobile, a similarly bipolar creation, which took three months and nearly $14,000 to customize. (Oh, and Bailey had to promise his wife he would redo the family kitchen at the same time). Driving around Los Angeles, Bailey receives plenty of honks and waves. More than a few Lakers fan thumb-and-forefinger "L" signs. The occasional middle finger. He gets pulled over by the cops, too – not because anything’s wrong, but because officers want to talk hoops. ailey's devotion hasn't gone unnoticed in league circles, either. Before Game 7 of a 2005 playoff series between the Clippers and the Suns, Bailey went to the airport to see the team off. Sterling introduced himself, brought Bailey along on the team flight, took him to a steak dinner, put him up in a Phoenix-area Ritz-Carlton and gave him tickets to the game. After a 2009 Clippers-Cleveland Cavaliers game, Bailey was walking with a friend outside a Los Angeles hotel when a voice came booming from the open window of a luxury SUV that had just pulled up to the valet stand: U-G-L-Y! You ain't got no alibi! Out jumped LeBron James, who did a little dance in Bailey's honor. One year earlier, Bailey ran into Mark Cuban in the Staples Center tunnel. The Dallas Mavericks owner offered him a job: I love what you do. Come root for the Mavs. The two exchanged email addresses, and Cuban flew Bailey to Dallas for a game against the Denver Nuggets. "It was amazing," Bailey recalls. "He gave me full access to the arena, full red carpet. I met the mascot, the cheerleaders, some of the people that do the play-by-play. The arena was rocking. But the thing was, my heart wasn't there. I told him I couldn't do it. He understood." Do we? Sports fandom can be a awful thing. We care too much, become dangerously tribal, invest too much of our time and money and passion – too much of our self-worth – into the largely meaningless, essentially arbitrary outcomes of ball-and-stick playground exercises conducted by grown men wearing numbered pajamas. In the name of sport, we exalt the irrelevant, cheat and lie and steal, beating the likes of Bryan Stow nearly to death and turning a blind eye to the alleged horror that took place in a Penn State locker room shower stall. Darrell, I really appreciate what you're doing. I've never seen my husband cheer. Ever. My daughter has been playing softball since she was seven. Now's she's in college. Today, he cheered first time. Following you. Thank you. "The fans make it all worth it," Bailey says. "My favorite part of the game is when I can get the whole arena to do the wave. I love that. It is so beautiful." Last night, the Clippers beat the Lakers in a preseason game. Paul was sensational. Worth a few tears, even. Only Bailey wasn't there. He was at Long Beach State basketball game, rooting for the 49ers, getting people involved, making good on a lockout promise. But not to worry. Clipper Darrell will be back in Staples Center for the team's regular-season opener, and every game after that, impossible to miss. Just look for the dancing guy in the funny suit. The raspy-voiced man who goes home to a cup of hot water spiked with honey and lemon. The most devoted Clippers fan in the world. The sane one.